We have about 50 pre-made dies in custom shapes ready to cut. Cheaper option for bulk decals (250+) than our "Any Shape" printed decals. As low as 19 cents each. 3 Material options: Paper (for indoor use), White Vinyl with UV coating (for outdoor use) and Clear Polyester with UV coating (for outdoor use). Each decal comes on its separate sheet for easy peel and stick application. Works great for custom bumper stickers. 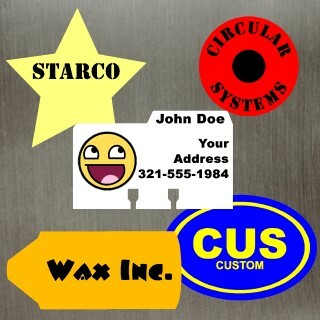 Want to get a quote for your custom shaped decal? Thank you for the extremely quick response and shipping of my order.